Insight organises data in project directories. When you nominate a directory for a project, the software will create a few sub-directories, including "100sei" for seismic data and other volumes. We recommend the use of further sub-directories to organise large projects or the work of multiple users. Some users want to split a project across more than one disk, for example, to store large volumes on a larger disk or one with better performance. To change the default location for storing and retrieving volumes, see How do I change Insight's default directory? in the FAQ section. You must select a project directory or create one before you can launch an application from Insight Launcher. Click Create New. The Create Project window will be displayed. Tip: Once you have created a project, you can configure the settings at any time by clicking on the spanner icon (see Configure a Project). In the Project Directory section, click Choose to select a project directory. In the Project Coordinate Reference System section, click Select CRS to define the coordinate reference system (CRS) for the project. The Select CRS window will be displayed. 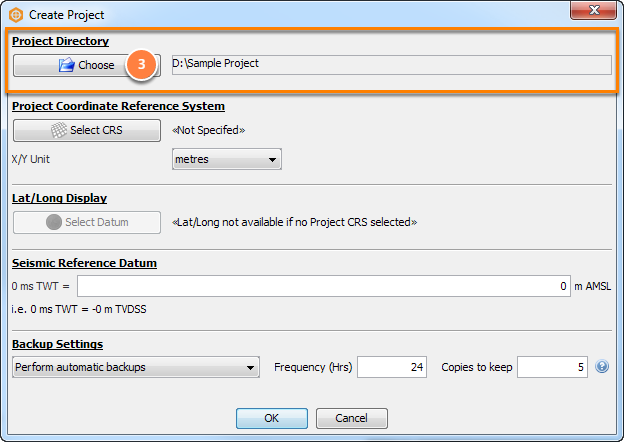 If you do not specify a project CRS, you can select to use metres, International feet, or US survey feet as the X/Y Unit for the project. 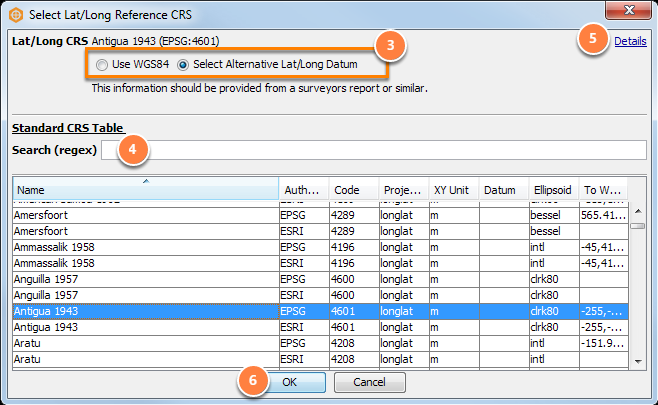 If you have specified a project CRS, then you can also select a datum for latitude/longitude conversions (lat/long will not be available if no Project CRS is selected). 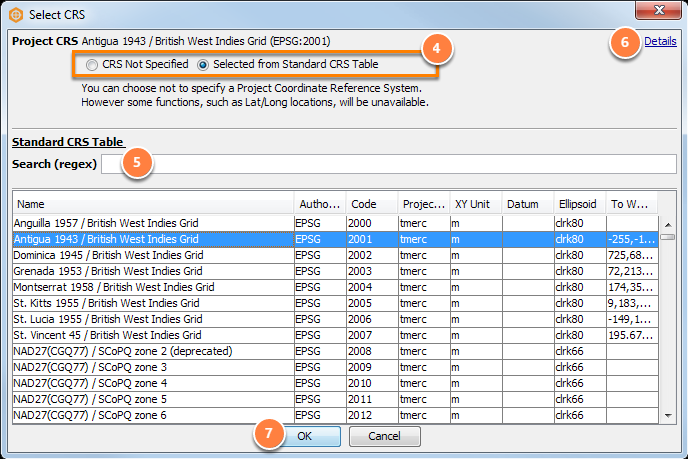 Select Use WGS84 or Select an Alternative Lat/Long Datum from the table. Once you have selected a latitude/longitude datum for the project CRS, you can configure the display of the latitude/longitude grids and information in the Map View (see Customising the Map View). 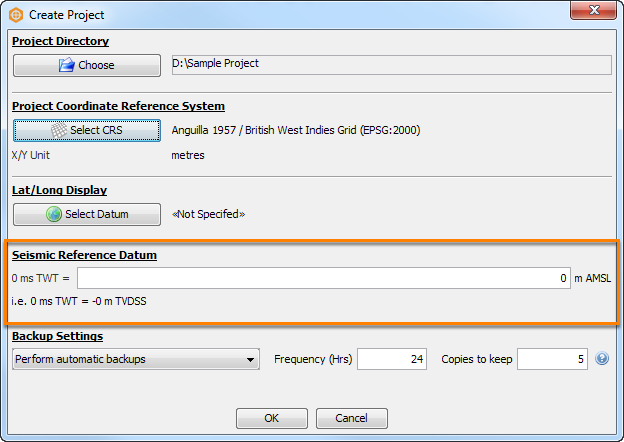 In the Seismic Reference Datum section, type a value to specify a project-wide non-zero seismic reference datum (AMSL). When you are satisfied with your settings, click OK to create your new project directory. Note: The automatic backups configured here should not be confused with session autosaves. Autosaves record the session (not the project), and occur once every 5 minutes. Only one autosave is available per session as each new autosave overwrites the previous one. As soon as the session is manually saved on closing, the last autosave is discarded (see Autosaves). 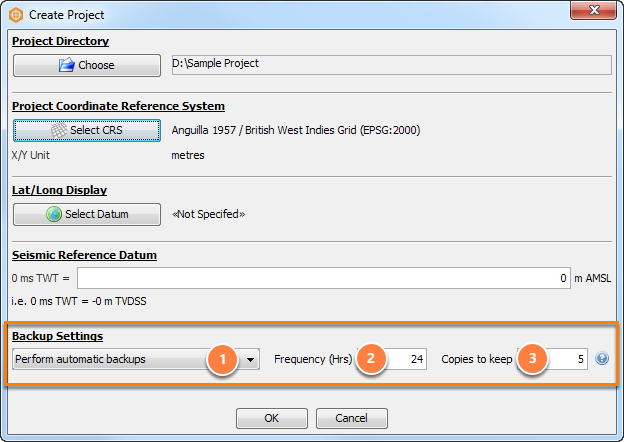 In contrast, the Automatic Backup creates and keeps a number of copies of the project database (as defined by the user) at a user-defined frequency. 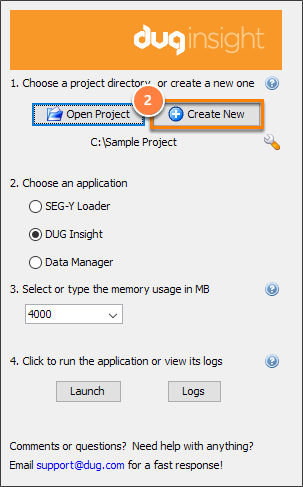 Once you have created a project, you can configure the settings at any time by clicking on the spanner icon in the Insight Launcher (see Configure a Project).